While not as dissenting as some, I remain highly skeptical about High Fidelity, Oculus gRift etc. Is the benchmark for progress mass adoption? Sure it is for $erial entrepreneurs like PR, but when was the last time the mainstream did anything but water down or outright reject anything even vaguely interesting about culture and accept, even laud the vapid soul crushing superficial one size fits all pap poisoning the watering hole all over the world? Despite the hype it may be that High Fidelity and Oculus gRift are non-starters except for the most enthusiastic early adopters. Could it be that the VR, VW etc. 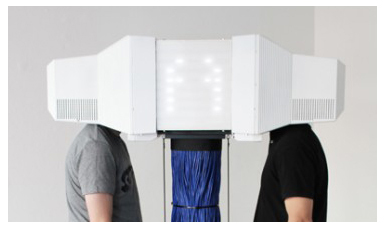 community is simply so ravenous for forward motion that they will accept placing some huge piece of plastic on your face as new and original or a virtual world based on haptic feedback (sure to be a hit with cyber sexers and perhaps a few sculptors unable to cope with 3D modeling) as a leap forward? None of these goofy technologies solves the basic failures of Second Life such as the complete lack of understanding about what actually happened in the first and still most well populated virtual world. 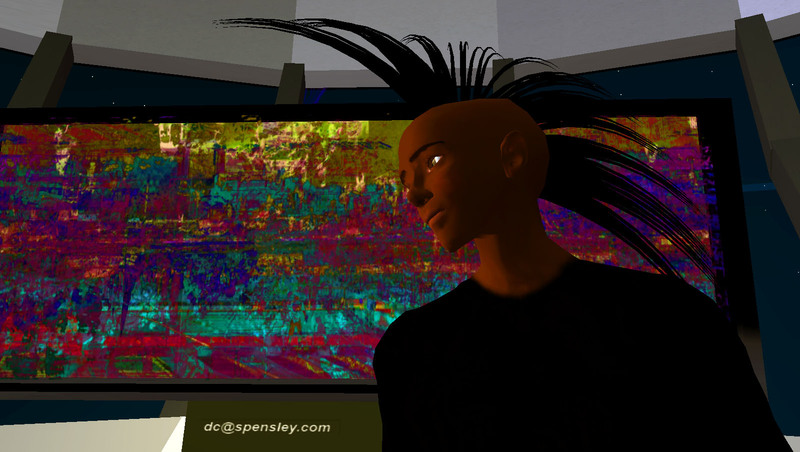 As the corporate kiddies managing Second Life got younger, less experienced and insightful about life (art or anything), their condescension towards even SLs most influential citizenry increased. The tendency being to treat anyone who would spend time in a virtual world to be a foolish crybaby, desperate for attention, instead of the well educated and optimistic pioneers of a deep sociological emergence that they were/are. LL simply didn’t have the faculties (or education, or desire) to understand what actually happened in SL and assumed that the sad bunnies were actually all that existed. And then there’s the concept of throwing the baby out with the bathwater and ghettoizing the present citizens of Second Life by simply leapfrogging to a new backwards incompatible format. This is far from productive, progressive or polite, to leave behind your best and brightest from a sociological and cultural point of view. Sure, this is typical of technology but when technology is a substrate for a thriving polity, should it be? With the ability to create life in the laboratory comes the added responsibility to treat this new life with respect due all living creatures. With the ability to create whole cultures should come a set of principles of equal or even greater weight, but hey, don’t look at me for that laundry list! So I will see you all there on Thursday, even if I will be wearing my “Skepticus gRift” helmet. SkyDance V Press/Dress (press preview, dress rehearsal) on January 23 a big success! The debut of the production on January 30 is fully booked and the ZeroG SkyDancers are ready to start the 2013 season! Please visit http://www.zerogskydancers.com for more up-to-date information. There are as many theories of virtual world arts as their are practitioners! A good start would be an academic taxonomy of what the main threads of art practice existing in virtual space. I have been working on a rationale since 2006. One caveat is that this taxonomy is just the result of my research and NOT intended to be the last word on anything, rather a jumping off point for conversation and further learning. 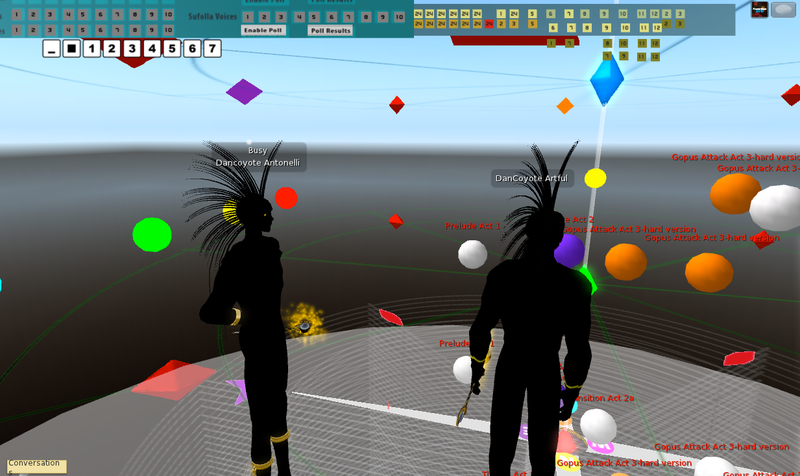 Many artists (the vast majority) strive to recreate physical world art objects and display them in spaces that look like galleries in Second Life. These might be termed “Remediators”, or artists who use SL in a way that ignores the difference in condition between physical space and virtual space. 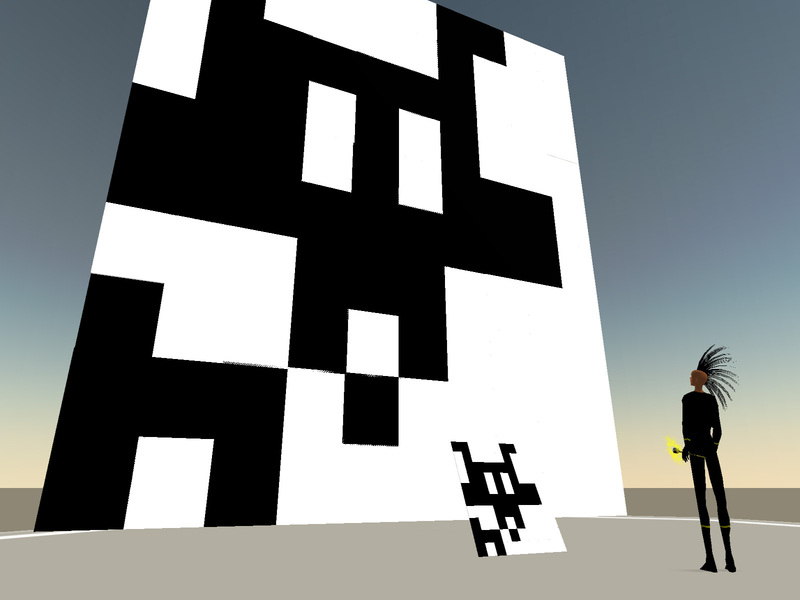 Some people call this “FLart” (flat or first life art) See almost any gallery in SL. Graciously hosted by NMC Arts and Letters Sim. The organizing principle behind this exhibition is to encourage guests to take advantage of Second Life’s ability to “cut the tethers” that hold us in the gravity based world and gently release real life concepts like “Ground” and “Water” in favor of another, less encumbered experiential space. 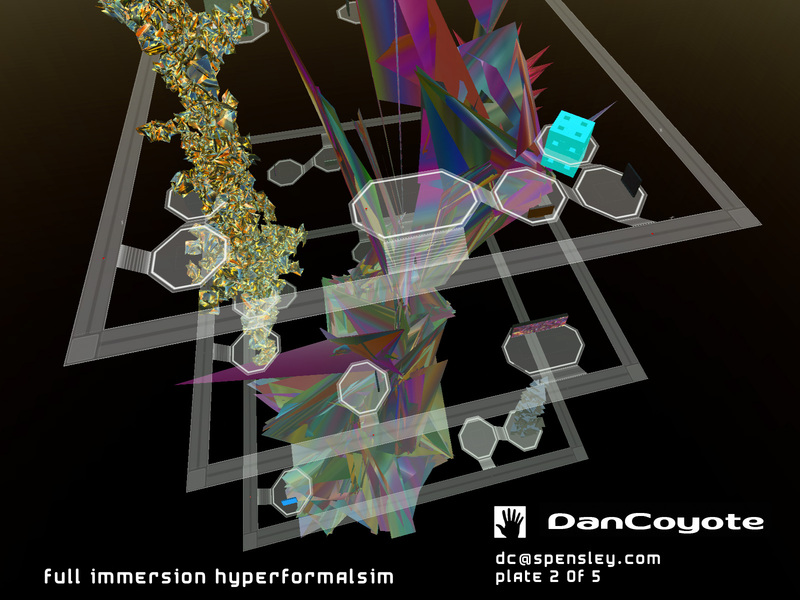 Hyperformalism is formalist abstraction in hyper medium. By disabling rendering of facsimiles of real life, a surreal space for viewing art is created. Things no longer conform to the field of view of your avatar and scale and context are no longer measured against the arbitrary figurative standard. Hyperformalism is a neologism that names something, distinguishes some observable social and cultural phenomenon. 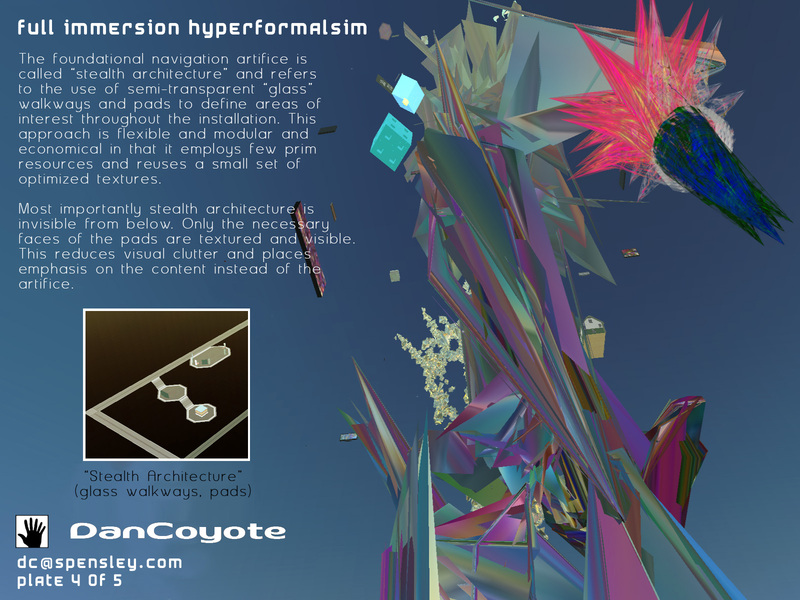 The term suggests a use for the word to describe formalist abstraction created in a hyper medium such as abstract 3D digital space or pure mathematical space.